You know who doesn't love a cheerleader? Customers. Those who post only positive blog entries on their company blog run the risk of appearing superficial and pushy. A better course of action would be to allow employees to post content on the company blog that might not be construed as all pixie dust and roses, suggests the authors of a new study from the University of Utah and University of Connecticut. In in the report "Blog, Blogger, and the Firm: Can Negative Employee Posts Lead to Positive Outcomes?" researchers discovered that moderately negative posts not only make corporate blogs more credible but also increase readership, which in turn offers more exposure to positive posts as well. Readers expect business blogs to tow the company line, which results in predictably positive and boring posts that make the blog more of a public relations and marketing tool than an open forum. But you add some constructive criticism or critical commentary to the mix and you've suddenly got some honesty and openness about the company's products or services. Let's say, for example, your company markets specialized automobile parts through an online catalog, and an employee notices that shipments are being delayed because of a particular supply chain practice that she finds archaic. You could choose to not publish her blog post addressing the issue, instead choosing to handle the situation in-house. Or you could run the post -- and any additional commentary that is spurred by the original post -- all in the spirit of improving delivery of your product to consumers. I like to characterize these types of posts as "positive controversy," because when a company or corporate blog permits moderate criticism of its policies, its products or its services, readership and public engagement goes up. This makes the blog more credible, and it also increases the chances that the other postings on the site will be read, shared and commented upon. However, the study found that too many negative posts on a corporate blog could muddy the waters, reversing the positive reaction from readers. 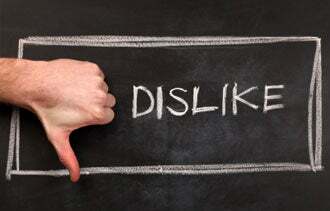 The authors suggest keeping such "constructive criticism" posts to around 15 to 20 percent. The key words here are diligence in delivery -- and editing. Obviously, you should cull out the posts that are mean-spirited, non-constructive or demeaning to your firm or its products or services. Also suggested in the study is to employ a policy of not curtailing or restricting negative posts. That's a far cry from actively encouraging negative commentary, which of course, could open a whole new can of worms. There's another advantage of growing a thick skin when it comes to constructive criticism online, and that is the ability to spot potential problems perceived by employees before they become major issues. By carefully encouraging constructive content from workers to appear on your own blog, you earn trust and authentic respect. Have you been critical on your business's blog? Leave a comment and let us know how it went.